Attach headphones or speakers to your computer by plugging them into the appropriate connection (often labeled with a little earphone or speaker symbol) on your laptop. Right click the Volume button (which looks like a little speaker) in the notifications area of the taskbar and in the menu that opens, click Playback Devices. In the resulting Sound dialog box, click the Speakers/Headphones item and then click the Properties button. Depending on your speaker and headphone models, these settings might vary. 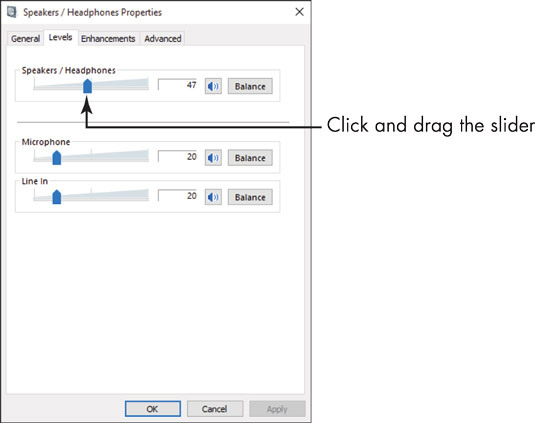 In the resulting Speakers/Headphones Properties dialog box, click the Levels tab, and then use the Speakers/Headphone slider to adjust the speaker volume. If you see a small red circle with a slash through it on the Speaker button, click it to activate the speakers. Click the Balance button. In the resulting Balance dialog box, use the L(eft) and R(ight) sliders to adjust the balance of sounds between the two speakers. Click OK three times to close all the open dialog boxes and save the new settings. If you use your laptop to make or receive phone calls, check out the Communications tab of the Sound dialog box. 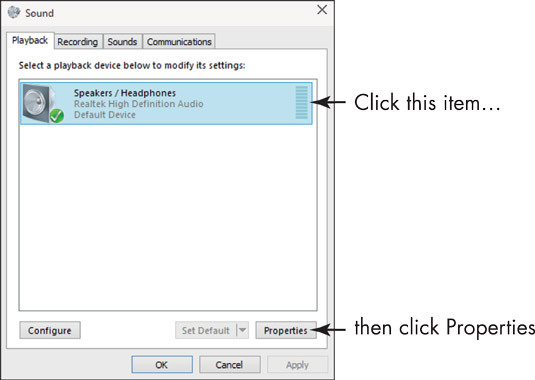 Here you can make a setting to have Windows automatically adjust sounds to minimize background noise.